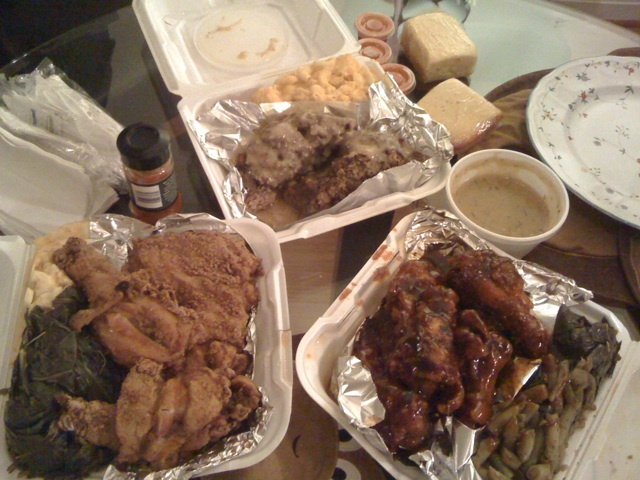 This is what we got : Fried Chicken (Dark Meat) with a side of collard greens and mac n cheese, then some meatloaf with gravy on it with a side of corn bread and more mac n cheese, and Bbq "wings" (Bigger than the drumsticks at chain restaurants) with a side of more collard greens and green beans... there were four of us (my awesome friends from SD came out to visit DC - thanks for making me try somewhere new Suz... loved it!) and we probably all ate twice and there were still leftovers. I'm still thinking about the food and want to eat more. And I don't even really like to eat chicken much - but the fried chicken was AMAZING. The wings were AMAZING. Green beans and Collard Greens were AMAZING. LOVED the mac n cheese... corn bread was delicious (more cake like) and i LOVED the gravy... For less than 50 bucks we got ALL the food above, ate twice and still had leftovers... MAN OH MAN... LOVE this place. If you are in DC and haven't tried it... i highly suggest you do! looks great. I have family in DC and will have to go there next time I am in town. I think your readers would love this giveaway as well as yourself. Thanks! I'm still thinking about the food and want to eat more. Really sooooooo delicious.